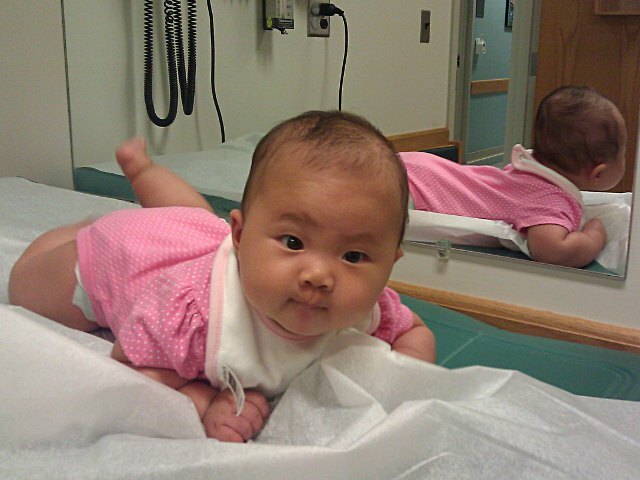 Arya had her four month check-up at the pediatrician’s office today. The four month doctor’s visit is part of the standard well baby check-up schedule. We actually showed up at the pediatrician’s office yesterday in a scheduling mix-up, so Arya got attention from all the nurses and staff two days in a row. The good news is that Arya isn’t quite as overweight as she was during her last visit. The bad news is that she is over 17 pounds and falls in the 90th percentile. She grew a little faster than average and now is in the 60th percentile at 25 inches. Unfortunately my baby still has a small head and her head circumference is in the 25th percentile. Arya actually pooped while at the doctor’s office in the weighing room. So in addition to the difficulty I had cleaning up the poop in the small room, I am sad to admit that she is a full 17 pounds even when completely empty. 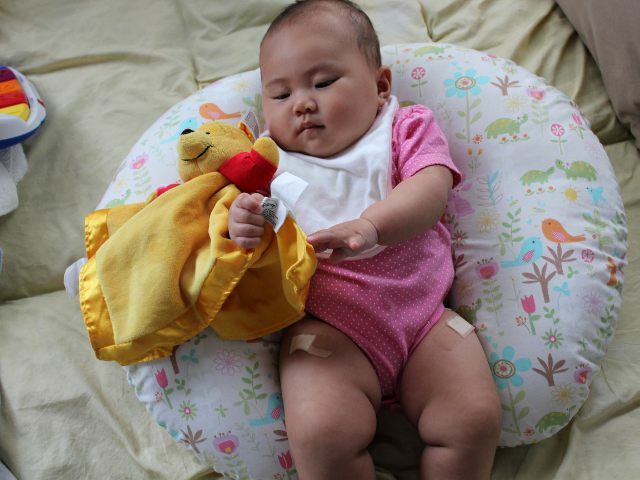 Her four month baby check-up shots consisted of two actual shots and one oral vaccine. She received immunizations for diphtheria, tetanus, and pertussis (DTaP), haemophilus influenza type B (HiB), pneumococcal diseases (PCV), polio (IPV), and an oral vaccination against rotavirus. Since pediatricians recommend having babies be a little hungry before the oral vaccination–to prevent against spitting up the vaccine–Arya gobbled the whole thing like it was candy. She didn’t like the two shots quite so much and screamed her lungs out for twenty seconds each time. Baby was still fussy when we got home so (with doctor’s approval) I gave her baby acetaminophen according to the standard baby dosage chart. We knew Arya had no problems with her eyesight since she could track objects and after our initial scare about baby failing her newborn hearing screening her hearing turned out to be just fine. In spite of our daily use of an infant carrier Arya has no signs of hip dysplasia either. Sleeping problems are a major point of emphasis during the standard four-month old pediatrician appointment. But since Arya has been sleeping better ever since Mommy got baby to sleep in her crib (with selective application of a controversial book) there was nothing to report about her sleeping. We are still waiting on her head to grow into the proper shape. Given the risk from CT scan radiation we won’t be subjecting baby to a head CT scan for now so final determination about her possible cranial synostosis will have to wait a bit longer. Our pediatrician seemed happy that Arya was such an easy patient. Arya was bored half-way through the visit while waiting for the nurse to bring the vaccinations. She entertained herself (and Daddy) by munching on the paper covering the exam table. The visit was routine so after receiving more baby formula sample cans we were done within 20 minutes. The next appointment according to the standard well-baby check-up schedule is at six months so hopefully Arya’s next visit to the pediatrician will be as uneventful as this one.